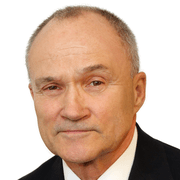 With fifty years in public service, including fourteen years as police commissioner of the City of New York, Raymond W. Kelly is one of the world's most well-known and highly esteemed leaders in law enforcement. Kelly was appointed police commissioner in January 2002 by Mayor Michael Bloomberg, making Kelly the longest serving police commissioner in the city's history, as well as the first to hold the post for a second, separate tenure. He also served as police commissioner under Mayor David N. Dinkins from 1992 to 1994. In 2002, Commissioner Kelly created the first counterterrorism bureau of any municipal police department in the country. He also established a new global intelligence program and stationed New York City detectives in eleven foreign cities. In addition to dedicating extensive resources to preventing another terrorist attack, the NYPD has driven violent crime down by 40 percent from 2001 levels. Commissioner Kelly also established a Real Time Crime Center, a state-of-the-art facility that uses data mining to search millions of computer records and put investigative leads into the hands of detectives in the field. Commissioner Kelly was formerly senior managing director of global corporate security at Bear, Stearns & Co. Inc. Before that, he served as commissioner of the U.S. Customs Service, where he managed the agency's 20,000 employees and $20 billion in annual revenue. For his accomplishments at Customs, Commissioner Kelly was awarded the Alexander Hamilton Medal for Exceptional Service. From 1996 to 1998, Commissioner Kelly was undersecretary for enforcement at the U.S. Treasury Department (the third highest post in the department at the time). There, he supervised the department's enforcement bureaus including the U.S. Customs Service, the U.S. Secret Service, the Bureau of Alcohol, Tobacco, and Firearms, and the Federal Law Enforcement Training Center. In addition, Mr. Kelly served on the executive committee and was elected vice president for the Americas of Interpol, the international police organization, from 1996 to 2000. In 1994, he was appointed by President Bill Clinton to serve as director of the international police monitors in Haiti, a U.S.-led force responsible for establishing an interim police force there. For this service, Commissioner Kelly was awarded the Exceptionally Meritorious Service Commendation by the President of the United States. A forty-three-year veteran of the NYPD, Commissioner Kelly served in twenty-five different commands before being named police commissioner. He was appointed to the New York City Police Department in 1963. Shortly thereafter he accepted a commission to the United States Marine Corps Officer Program. He served on active military duty for three years including a combat tour in Vietnam. He returned to the police department in 1966 and entered the New York City Police Academy, graduating with the highest combined average for academics, physical achievement, and marksmanship. He was also a member of the inaugural class of the New York City Police Cadet Corps for three years while a student at Manhattan College. During his tenure in the NYPD, Kelly received fourteen citations of merit for outstanding police work. Commissioner Kelly retired as a colonel from the Marine Corps Reserves after thirty years of service. Commissioner Kelly holds a BBA from Manhattan College, a JD from St. John's University School of Law, an LLM from New York University Graduate School of Law, and an MPA from the Kennedy School of Government at Harvard University. He has been awarded honorary degrees from the Catholic University of America, Manhattan College, St. John's University, the State University of New York, the College of St. Rose, Iona College, Marist College, New York University, Pace University, Quinnipiac University, and St. Thomas Aquinas College. Kelly is a Distinguished Visiting Fellow at the Council on Foreign Relations, Vice Chairman of K2Intelligence, a member of the Board of Directors of the Boys Club of New York and Hain Celestial Group, Inc., and an ABC News contributor. In September 2006, Commissioner Kelly was awarded France's highest decoration, the Légion d'honneur, by then French Minister of the Interior Nicholas Sarkozy. Sochi’s volatile surroundings, the imposing scale of the games, and the need for an international coordinated response in the event of attack present security risks for the 2014 Winter Olympics, says CFR’s Ray Kelly.